The tensile properties and fracture behavior of cast aluminum alloys A356 and A357 strongly depend on secondary dendrite arm spacing (SDAS), Mg content, and, in particular, the size and shape of eutectic silicon particles and Fe-rich intermetallics. In the unmodified alloys, increasing the cooling rate during solidification refines both the dendrites and eutectic particles and increases ductility. Strontium modification reduces the size and aspect ratio of the eutectic silicon particles, leading to a fairly constant particle size and aspect ratio over the range of SDAS studied. In comparison with the unmodified alloys, the Sr-modified alloys show higher ductility, particularly the A356 alloy, but slightly lower yield strength. In the microstructures with large SDAS (>50 µm), the ductility of the Sr-modified alloys does not continuously decrease with SDAS as it does in the unmodified alloy. 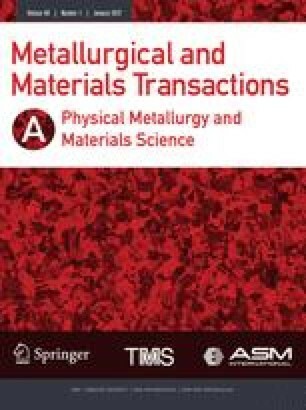 Increasing Mg content increases both the matrix strength and eutectic particle size. This decreases ductility in both the Sr-modified and unmodified alloys. The A356/357 alloys with large and elongated particles show higher strain hardening and, thus, have a higher damage accumulation rate by particle cracking. Compared to A356, the increased volume fraction and size of the Fe-rich intermetallics (π phase) in the A357 alloy are responsible for the lower ductility, especially in the Sr-modified alloy. In alloys with large SDAS (>50 µm), final fracture occurs along the cell boundaries, and the fracture mode is transgranular. In the small SDAS (<30 µm) alloys, final fracture tends to concentrate along grain boundaries. The transition from transgranular to intergranular fracture mode is accompanied by an increase in the ductility of the alloys.